Frugal living blog about all things thrifty: money saving, DIY, crafts, gardens, food, fitness, woodland, wildlife and making the good life affordable! It's about the freedom to enjoy a frugal lifestyle while pursuing a lifelong ambition... and sharing it with you all. If anyone ever tells you quail are lovely, simple to care for little gamebirds, remind them of how silly these feathered friends can be. 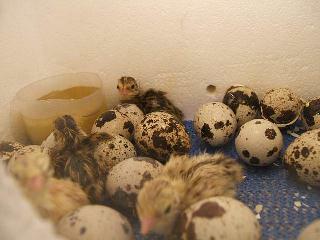 My lovely little home-hatched, Japanese Coturnix Quail defy everything I've just said, so ignore it all. They don't hate the cold. Mine are hardy, Scottish quail. MacQuails, even! Last night, it being such a clear, starry night, I wrapped up and went outdoors late to watch the Gemenids - meteors - that were flashing overhead. It was about 10.30pm, it was -5C and the sky was amazing, so I guess that must have been why all the quail were out runing about their pen! I could hear them chirping and gurgling that throaty noise they make when chasing one another. They were out playing in the freezing moonlight! This morning, I peered anxiously into the run half expecting to see stiff little feathered bundles frozen to the ground but oh no, that wasn't what my quail were doing, they were dust bathing in their shavings inside the shelter and there were eggs lying OUTSIDE, FROZEN TO THE GROUND! Lifting them out, I could clearly see that the eggs were frozen solid, they had expanded and had split their shells from end to end. No wonder the Frugaldom cat likes meal time... 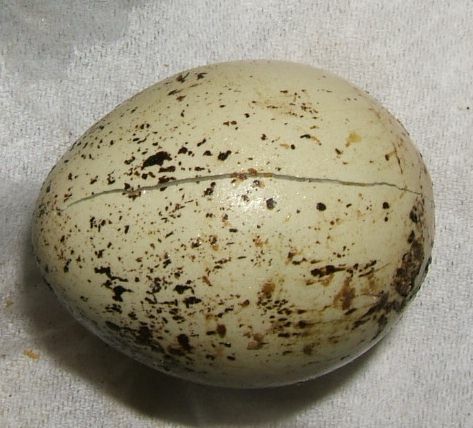 I'd to thaw the eggs in her porridge so she didn't miss her fresh quail egg breakfast. How does the saying go? Toffs are careless? Frugal living does have some luxurious side effects besides helping you remain debt free. Not quite quail eggs but our dog gets any eggs from our chickens which get cracked. I swear she runs into me on purpose so they knock together and if I put them down the bench while I take my wellies off, she "accidentally" nudges that so they roll off... Tsk! Many thanks for taking the time to comment. All comments are moderated to help prevent system abuse by spammers, time-wasters and chancers, so your comment will not appear until it has been manually accepted for publishing. This will be done as soon as possible - I check for updates regularly. We are on GMT - London times. This is not your normal, run of the mill, frugal living blog. It's about much more than simple cooking, cleaning and crafting and much more than simply finding the most economical ways of running a household; it's about frugal entrepreneurs, self employment, small business and keeping the finances in order to achieve and maintain debt freedom. My personal project is Frugaldom - a lifelong ambition to create a wilderness haven for expressing that freedom in all its glory. WELCOME TO FRUGALDOM! Frugal Blog is all about budgeting, DIY, crafts, gardens, foody stuff and the good life. The Doon of May - a fantastic project in the making. Embarking upon a simple, yet fulfilling life. Con-dem-ned Plebdom - Cheers Marra Dave! WIRED: "Cold Fusion gets red hot and aims for EU"
Copyright NYK Media. Simple theme. Theme images by Ailime. Powered by Blogger.